Contact Enhanced Category MODULE. 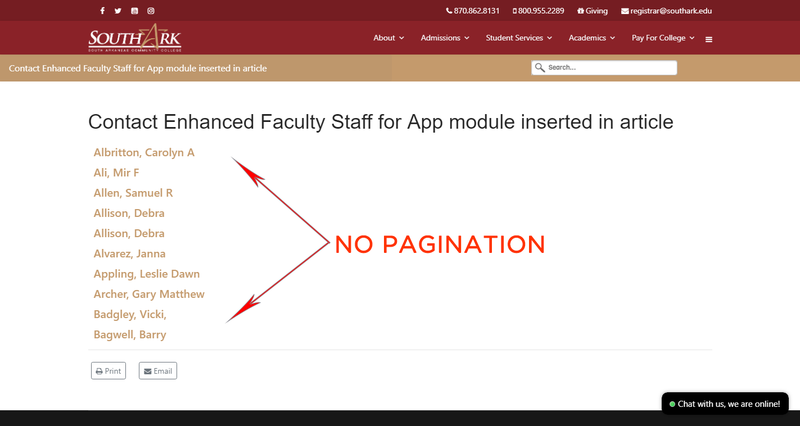 No Pagination. - Ideal Extensions Forum - Ideal Extensions for Joomla! Contact Enhanced Category MODULE. No Pagination. Using the Contact Enhanced Category MODULE. There doesn't appear to be any pagination so that more names can be seen. Actually, the default limit is set to 10, not 20. The limit is in place because most users use on a module position where it space is usually very limited. Anyway, you can change the limit by going to the module options under the Filtering options and set the option Count to a much higher value (999 for example).